O-mei Taiji students with Sifu Lu holding their 1st place award in Group Taiji Barehand at 7th World Kungfu Championships, Emeishan, China. O-mei students at the 13th World Wushu Championships - Jakarta, Indonesia. 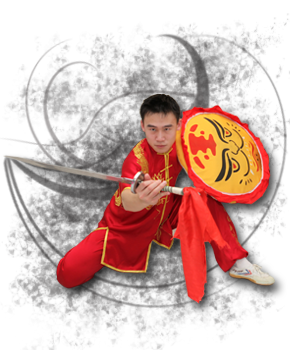 Established in 1993, under the direction of Sifu Xiaolin Lu, O-mei Wushu Center is a professional martial arts center that teaches contemporary and traditional wushu styles along with weapons, health qigong and tai-chi. At O-mei, our primary focus is on the development of the student, either concerning personal growth or physical exercise. 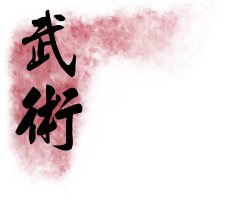 O-mei has experienced instructors to provide the opportunity for students to compete in all categories of Chinese martial arts tournaments at the local, regional, national and international levels. Wushu, the ancient fighting art of China, is both a contemporary sport and a traditional method of self defense and natural healing. 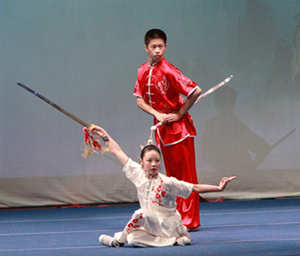 Wushu's many styles dates back to early Chinese society when tools and weapons came into use. 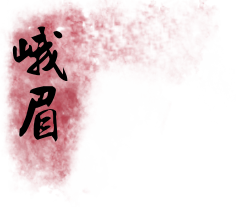 The most famous of all Wushu styles comes from the Shaolin Temple of Hunan Province, China. The monks of this temple believed that martial arts practice would increase the longevity of life and discipline their spirit. The exploits of the warrior monks are well documented through China's history but as military technology advanced, the role of wushu in warfare gradually diminished. Nevertheless it still retains the original martial nature and its athletic and moral values. Today it is a beautiful and awe-inspiring sport and cultural performing art, with the benefits of physical fitness and self-defense. There is a style suitabe for everyone from preschoolers to senior citizens. In the past few years the popularity of wushu in China has been increasing, and China expects to include it in the future Olympic Games. Other nations, including the United States, are now beginning to develop a large following for this ancient art.